Former Republican presidential nominee Mitt Romney has announced he is running for a US Senate seat in Utah, while taking a dig at President Donald Trump. In a Facebook campaign video, he lamented that Washington was sending "a message of exclusion" to immigrants. A vocal critic of Mr Trump, Mr Romney is seen as a shoo-in for outgoing Republican Senator Orrin Hatch's seat. The ex-private equity manager has kept a low profile since losing his 2012 race to oust President Barack Obama. I am running for United States Senate to serve the people of Utah and bring Utah's values to Washington. Touting his management of the 2002 Salt Lake City Winter Olympics, Mr Romney said his adopted home state was a model for Washington DC. "Utah welcomes legal immigrants from around the world," he said in a Facebook campaign video. "Washington sends them a message of exclusion." Since his failed White House campaign, Mr Romney has served as a chairman of his son's investment firm and on the board of directors of Marriott International. But he has assiduously maintained his links to the Republican party. In 2016 he positioned himself as the voice of mainstream conservatism with stinging attacks on Mr Trump. 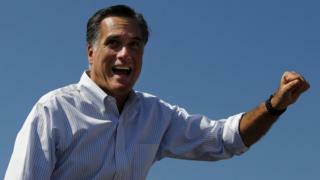 "His promises are as worthless as a degree from Trump University," said Mr Romney. Mr Trump hit back, calling Mr Romney a "failed candidate" who "choked like a dog" in the 2012 race. However, once Mr Trump captured the White House, Mr Romney dined with him in November 2016 at a Manhattan restaurant while he was in the running to be the president-elect's secretary of state. Mr Romney did not get the job. Perhaps mindful of a Romney resurgence, the president recently urged Mr Hatch, seen as a Trump loyalist, to run again for another six-year term. In December, Mr Trump travelled to Utah where he called Mr Hatch "a true fighter" and said he hoped he would continue to serve "in the Senate for a very long time to come". But the veteran senator announced last month he would step down at the end of the year. "Every good fighter knows when to hang up the gloves," said Mr Hatch. The longest-serving Senate Republican with seven terms under his belt, he was first elected in 1976. Mr Romney's campaign announcement was enthusiastically welcomed by his former running mate, House of Representatives Speaker Paul Ryan. "This is a terrific day for the United States Senate," said the most powerful Republican congressman in a statement. "Our party and our country are always better off when Mitt is engaged, and I know that he will put his unparalleled experience, conservative leadership, and lifetime of service to work for Utah in the US Senate."